Best acne treatment for men to get rid of acne permamently. This treat for acne features acne products with prescription-grade acne medication to control acne and prevent acne scars. Clinically developed and recommended by leading dermatologists, Acne Treatment System is guaranteed to control acne -- which is why we’re giving you a 30-day, risk-free trial. There are not many skin treatments that have met and exceeded my expectations. This acne treatment not only treats the acne permanently, but revitalizes the skin with the toner. I have very sensitive skin and have used a great amount of acne treatments, but none of them come close to the results of this treatment. I am very thankful for stumbling upon this product because my skin is clear, revitalized, and tone because of this easy to use acne cleansing system. 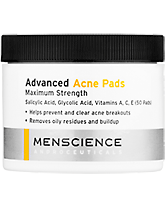 MenScience Acne Treatment System worth a shot! I am a first time user and found this product to be very effective controlling my acne. The key ingredients , labeled on front of the bottles, definitely make the treatment system work. 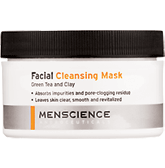 I still have not ordered other MenScience products yet but thinking about getting the mask which may be a good compliment to the Acne Treatment System. Every guy should give it a shot! The cleanser works great. Other cleansers I have tried with similar ingredients have been drying and irritating. This is surprisingly light and leaves my skin feeling clean. I would recommend also the green tea mask along with this kit as well as the moisturizer. This is by far the best acne treating cleanser that I have ever used. It's strong enough but not overbearing like most competitors. Other products over dry my skin causing it to over produce oil resulting in a break out. The combination of ingredients in Mens science thoroughly cleanses my skin without irritating it and the toner is just as amazing. This is absolutely one of the best skin care treatments on the market!! After reading the Men Science reviews for the acne treatment system I decided to go ahead and try it for my self. Now my skin looks better than it has ever looked before, Im 18 and have had mild acne since I was 13. To this date I've been using the system for about two months and in the perfect world would never stop using it. At first I almost stopped using the product because the first two weeks my skin was broken out, but after reading the Men Science online magazine I found that this was normal. Since then I have been getting complements on my skin on a daily basis. I wash twice a day, morning and night, then in the middle of the day I use the Face tonic. Every other day I use the lotion and this routine works excellent for my mildly oily skin. Don't be afraid to try! Its worth every penny if you want ultra clear skin. This product is pretty good Id say. I dont have a lot of experience with other products so its hard to make any accurate comparisons. I also dont have really bad acne just a few bumps on the forehead , face and chin area occasionally. Before this product though I was tired of seeing my face left scarred and marred by acne. This product has subdued all breakouts for me. I do still get some bumps but nothing catastrophic like I used to. Plus any I do get can be gone in a night or day by appying some of the stuff in the small tube. I usually go with one application of the face wash every morning, then if Im really sweaty after playing basketball or something I might to another later but thats rare. One usually does well for me, two I bet would be better but Im lazy. The wash will not dry your face out to bad, I rarely use the tonic as I prefer cocoa butter for my face. The only problem i have is the price of these items should be reduced. I am a poor college student and the economy is poop so chillax on the price. Works well for greasy faces I think, my face gets pretty oily around midday. I've suffered with acne since I was a teenager and tried many products. This is by far the most effective combination to keep my acne under control. I use it when I have light acne and when I occassionally get more severe acne. The toner is great to use every day. Face wash is truly wonderful it never leaves your skin dry but always clean and mildly tight. The toner is also a solid product however it runs out quick! This system has definitely reduced my pores and cleaned up some of my acne not completely gone yet after 3-4 weeks yet have noticed positive results. I have had bad acne since I was 14 and went the dermatologist route and had it cleared. Then I started breaking out. So I had to try something new and this works amazingly while keeping my skin healthy. The only problem would be the acne cream isn't as strong as it should be. But ill be using this for a long time. Ok product with moderate success. I used to have clear skin then stress caught up with me and I been breaking out ever since. So then I went and found the MenSciecne Acne Treatment System, it doesn't leave the skin feeling dry, it works fast, and best of all it improves your skin. I am amazed and stratified with this product. Glad I found it. I use this product everyday, all my friends and co-workers compliment the new look of my skin. It gets better and better everyday. I've found my fountain of youth! When I was thinking about buying the acne system I was very skeptical of how effective it would turn out. I had finally decided to purchase it based on the reviews that I read and I got to say that it been a savor for my skin. In three weeks I saw dramatic changes. When compared to other popular brand this was the only one that made any positive difference. The only bad side to using it would be that it tend to make the skin a bit dry and flaky but that can be fixed with moisturizer. I plan to buy it again in the future as well as other products from this site. careful if you have cystic acne! Made my Cystic acne much worse and can bleach hair. Normal acne this looks like it could be good for, but don't use if you have cysts. Made my cysts get really big and sore and made my red marks worse. Works better than any store or over the counter product. The entire line is great and most are oil free. The natural ingredients are very important to me. I use the face wash, sun care and daily face lotion everyday! Permanent feature in my shaving cabinet! I seriously was doubtful that this system was going to be better than anything I had tried over the past few years. I read the reviews and was still quite skeptical, although hopeful and excited, as well. From the first day of use, I noticed a profound change. Yes, I still broke out a couple of times, but the recovery period from the time I broke out was greatly shortened, and the blemishes healed cleanly. The other day, my partner noticed and commented that my skin was tighter and more refined. That was one of the best compliments that I've received in a long time. I'll definitely be using these products again!! I am 61 and have had acne due to sweat on my forehead and upper lip area from cycling. Despite immediately rinsing these areas after a ride, I have acne. I was a little sceptical about this 3 step treatment, especially given the price. However, after using it for a month now, I am seeing positive results. The facial wash is very mild and feels great. I have just ordered some more products from Mens Science and hope for the same kind of results. After researching ingredients used by other men's products, I can understand why these products cost more and are more effective. It's the better level of ingredients and lack of alcohol that makes these formulas more effective. I've tried a lot of different acne treatments that have done nothing except empty my wallet. This stuff is simple and easy to use. A little goes a long way and it has done wonders for my face. I have my confidence back and I can look people in the eye without feeling like they are staring at the zits on my face. Really glad I found this acne system. Cleared my skin. Other products didn't help, but it has made my complexion clearer, especially with the brown spots from scarring! I was amazed. I would highly reccomend! Use the Acne Treatment system twice a day it made my skin smooth and have less acne. It started working immediately, you can feel a difference in your skin. Best acne system I've ever used! best time is to use all three right after a shower, use the face wash in the shower and the tonic after you get out and follow with the lotion after the tonic drys. I bought this as a gift for a friend who has been struggling with acne for several years. He had tried the usual over the counter medications, but nothing seemd to work. He had seen an advertisement for this acne treatment, but thought it was the usual hype for an ineffective product. I decided to fork over the money to give it a try. Within a week of using it, he noticed a big difference. The acne was disappearing on his face and his shoulders and in addition he was no longer plagued with razor bumps, which was also a big problem for him. This was the first product that actually worked! The downside: It is expensive and that alone may deter some shoppers. (That is my only criticism.) But it works, and the relief it brought was well worth the cost in this instance! I no longer suffer from ugly pimples on my face since using this product. This product works as advertised. My face is clear and smoother. I use the product as directed. finally, i found peace of mind when it comes to skin care! Cleanse Daily Face Wash: This advanced liquid cleanser promotes a clear complexion by removing the bacteria, impurities and oily residues that cause acne. Clarify Advanced Face Tonic: This gentle, yet high-potency wonder softens, smoothes and conditions for a radiantly clear complexion. Professional-grade Alpha Hydroxy Acids remove organic buildup while dissolving dead skin cells and pore-clogging, oily residues to renew and clarify. Cure Acne Therapy Lotion: This intensive acne medication cures recurring acne with dermatologist recommended Benzoyl Peroxide. Enriched with vitamins and skin restoring ingredients, the prescription-grade formula repairs and conditions acne stressed skin to help prevent scarring. Ultralight and oil-free, the Lotion absorbs quickly and invisibly without leaving a residue. Use of powerful acne products increases sun sensitivity and should be accompanied by the non-comedogenic TiO2 Sunblock to help prevent acne scarring. We want you to be happy with your purchase. If youre not satisfied with your product, simply return it to us within 30 days to get a full refund  no questions asked.